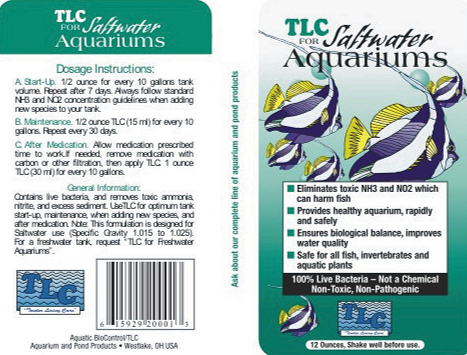 The live bacteria from TLC Products are a customer favorite and our best sellers! These products have been tested by industry experts and outperform the competition with respect to results, concentration, and shelf life. Use the Freshwater or Saltwater TLC product (which is also referred to as Optimizer) on a weekly basis to create crystal clear, odor free water and a healthy environment and the Freshwater or Marine SAT product (which is referred to as Clarifier) on a monthly basis to help control nuisance algae. If you are having problems, you should dose the Freshwater or Marine SAT product weekly, as directed, until your problem is corrected. * All bacteria use should be viewed as a complement to a strong aquarium management routine that includes water changes, close observation of feedings (as to not overfeed), and the consistent cleaning of ALL mechanical filtration. Completely natural and reef safe - not a chemical.